The Paynesville boys' and girls' cross country teams are gearing up for a new season, both hoping to reach the state meet again despite losing extremely talented runners. The girls team will try to improve upon their second place finish in the state meet last year, but it won't be an easy task after losing two-time individual state champion Jen Hess. Ninth grader Brooke Schmitz, a two-time all-state runner, and sophomore captain Kim Hess, a state individual qualifier last season, do return. Eighth grader Kacy Nehowig, who joined Hess and Schmitz as all-conference runners last season, also returns. Tom Flannigan, Freddie Stock, Jason Wendroth, and Chad Wyffels lead the team in a warm-up run. Other returning runners are senior captain Nicole Flint, eighth grader Tanis Beireis, both varsity regulars last year, and state alternates junior Trisha Wendlandt and ninth grader Sheena Hoekstra. New runners this season are ninth grader Lindsey Wyffels, eighth grader Krista Wendroth, and seventh graders Brittni Schmitz, Kaitlyn Frenchick, and Melanie Koerner. The girls are a young team, with only one senior and one junior, but they still have a lot of experience even with their young age. Head coach Darrel Carstens believes the girls' team is among the top six or seven teams in the state right now. He believes if they improve and develop as he hopes they will be among the top three teams at the state meet, which is always his ultimate goal: getting on stage and receiving a team trophy. The strongest competition in the conference and in the section for the girls should be from St. Cloud Cathedral. Last year, Cathedral placed sixth in the state meet. According to Carstens, it will be difficult to stay ahead of the Crusaders throughout the season. The boys team returns four varsity competitors to the squad: senior captains Riley Flanders, Tom Flannigan, and Freddie Stock, as well as junior Chad Wyffels. Carstens expects three sophomores to round out the top seven this season: Jason Wendroth, Matt Mehr, and Chris Utsch. In 2000, the boys team won their first state championship, but none of the top seven runners are left from that championship squad. Flanders was an alternate for that team. In the past two years, the boys have graduated eight strong runners. 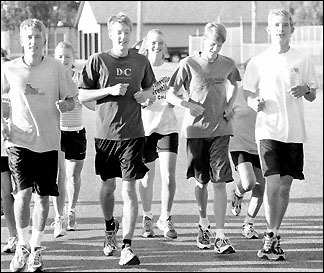 In 2001, the boys team took third place in the section meet, just missing an opportunity to run at state. The team was ranked as high as fifth in the state during the season. The team lost their top three runners from last season: Jesse Rein, who missed all-state honors by three places last year; Dan Pearson, who earned all-state honors in 2000; and Scott Thompson, who was an alternate for the 2000 championship team. Carstens believes the boys team has a good shot at going to state. In their section, St. Cloud Cathedral returns six of their top seven runners from their second place team at state in 2001. They look to be the favorites in the section once again. After that, though, Paynesville is among four teams chasing Cathedral, trying to make it into the second state qualifying spot. Other runners for the Bulldogs this year are senior Adam Christian, sophomore Cory Christensen, and eighth graders Dugan Flanders and Peder Thompson. This is Carstens 29th year as the head cross country coach. Assistant Rick Houske is in his 23rd year, and volunteer coach Todd Spanier has been helping for three years. The cross country teams have their first meet of the season on Tuesday, Aug. 27, at Morris, starting at 5:30 p.m.
Aug. 27	at Morris	5:30 p.m.
Sept. 5	at BBE	5 p.m.
Sept. 9	at LPGE	4:15 p.m.
Sept. 12	at NLS	4.30 p.m.
Sept. 21	at Milaca	10 a.m.
Sept. 26	Koronis Invite	4:30 p.m.
Sept. 30	at Becker	4:30 p.m.
Oct. 8	WCC at LPGE	4:30 p.m.
Oct. 15	Subsection at Albany	4:30 p.m.
Oct. 24	Section at Becker	4:30 p.m.
Nov. 2	State at Northfield	9 a.m.